I am blessed with living on a "tree top" surrounded by thousands of trees around my cozy nest and bestowed with over 76 species of yard birds. Most people worry about having so many trees that dead or diseased trees might fall upon their roof one day, fortunately I never have to worry about that because I have some special "tree doctors", the woodpeckers, regularly visit my trees! One male Red-bellied Woodpecker habitually drums on my gutters in early spring; a pair Downy Woodpeckers will never forget to say good night at my suet feeder; Norther Flickers like to play "seek and hide" with their favorite food, ants and Pileated Woodpecker's (click to view a video ) loud, whinny calls remind me to take a break in my gloomy days. Out of seven commonly seen species in the east of United States, the one never shows up in my backyard is Red-headed Woodpecker. 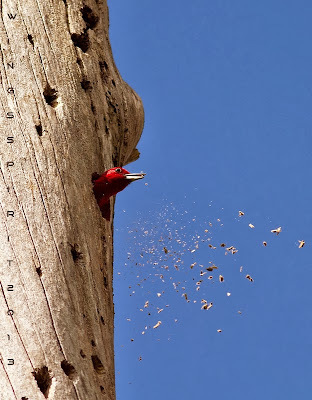 A friend of mine from Down Under was fascinated of knowing these woodpeckers are capable of carving into trees and he gave me an assignment to find a woodpecker coming out of a nest hole. Seeing and finding a pecker is an easy task but photographing one out of a nesting hole is merely a luck or I have to wait till the spring. One day on my way to my fall migration field trip, sluggish morning traffic allowed me to enjoy my slow ride and accidentally spotted a pair flickers trying to excavate their wintering home. Too bad that I did not have my camera with me that day. When I returned to the same spot the very next day, flickers did not show and they never returned for the next seven days. I was disappointed and told myself, maybe they found another better location and moved on. Frankly, this location is not an ideal spot per photographer's point of view. First, this tree is located in a residential neighborhood and I have to park my car in a shopping center and walked for 20 minutes. I might even have to climb on someone's wall to have a better angle. Secondly, the opening of this hole is facing east. Due to the poor light condition, I will either snap the back of birds with great light or the front of birds with dark faces. Thirdly, since I could not seem to relocate this pair and I believed they might move to another better location. I did a thorough research and reading, found out that if woodpeckers lay eggs in a cavity near a busy street or power poles, their chicks might not fledge or survive. I am sure young birds are afraid because I will be so scared jumping into this strange world the first time if I were a young bird seeing no trees around but a train of four-wheeled boxes ("cars" in human term) along the streets and many two legged talking to themselves none stopping. Soon I gave up searching and moved on to my routine boring tasks till one day ... something hit me, A Snag! "In forest ecology, a snag refers to a standing, dead or dying tree, often missing a top or most of the smaller branches. In freshwater ecology it refers to trees, branches, and other pieces of naturally occurring wood found sunken in rivers and streams", per wikipedia. Standing snags provide crucial habitats for as many as 1,200 species of insects, amphibians, fish and birds. Tree frogs and beetles may use the empty space between trunk and bark as their shelter at night, woodpeckers excavate nesting holes on snags and search termites and beetle larvae as food, many fish use snags at their spawning sites and the top of the snags become an important look-out for hawks to catch prey. That day I was 20 minutes early on my meeting. While waiting for my meeting to start, I birded around a street near by and suddenly I heard this loud calls, without a second thought, I knew it was a Red-headed Woodpecker! In a split of second, I noticed a snag just across the street. A Red-headed was sitting on top. It would be nearly impossible to photograph this bird without going to someone's private backyard. After my meeting, I visited the home owner and expressed my intention of photographing this woodpecker. They were so kind in allowing me to go to their park-like backyard and investigate the possibility of photographing the woodpecker I dreamed to snap! It was late in the afternoon so I told them I will return the next day. They don't want to be named here but I owe my gratitude to these nice, nature-loving people. They assured me I can stay as long as I like. I always run into nice folks around town. Talking and advocating the importance of wildlife protection and habitat conservation for birds often make new friendship. 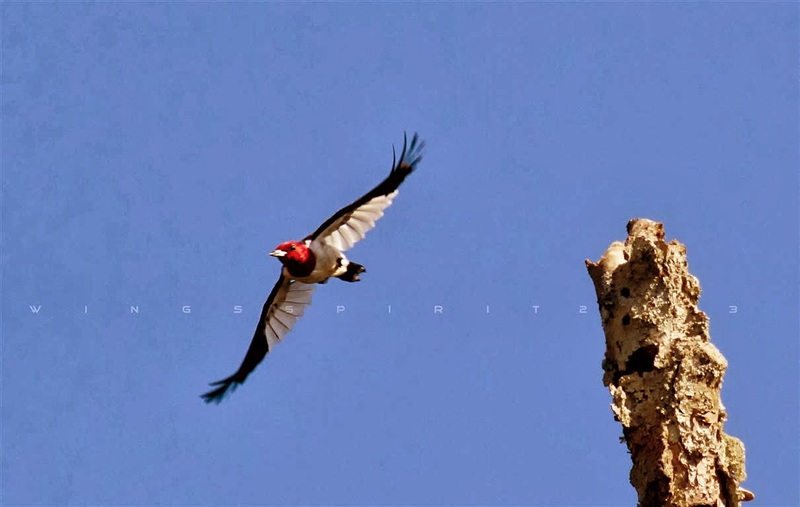 Woodpeckers are not song birds, they don't sing, instead, they drum on trees, chimney, gutters to attract mates and deter their rivals during breeding season. 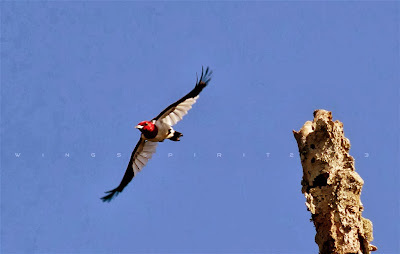 Unlike other woodpeckers, Red-headed Woodpeckers do reuse their nest year after year and they are also the only woodpecker catching insects on wings. During breeding, bonding pair will vigorously defend their territory and they live a separate life during non-breeding. Another interesting behavior of Red-headed is that they start caching acorn in crevices when insects slowly dying out in fall. 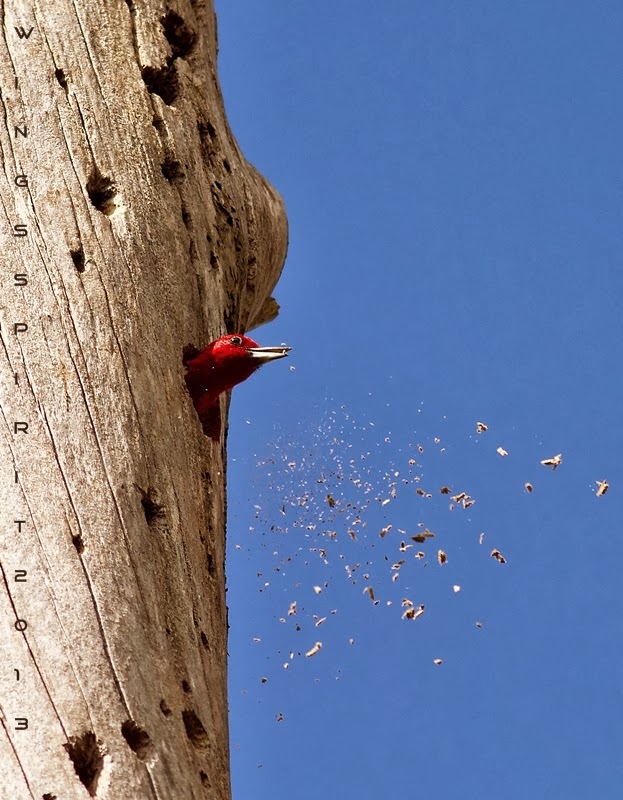 Though not much research has been conducted, the number of Red-headed Woodpeckers has declined steadily according to the North American Breeding Bird Survey and it has been listed as "Near Threatened" species per IUCN. Besides the scarcity of seeds and nuts during winter, removal of snags from many manicured community causes the greatest concern. Red-headed Woodpeckers live in an open forest, they prefer to nest in older trees, but they also can be seen throughout younger forest. If you happen to have few snags in your backyard, or if you are about to develop a new construction by deforestation, please leave those dead trees for woodpeckers. Even fallen logs can be a food source and shelters for them! When we learn to protect birds and their habitat, we actually protect ourselves from going "backwards". It will take 30 years to grow into a mature forest but it will only take one match to destroy it. Be a tree hugger and I hope you are inspired! 2. Do woodpeckers use their roosting hole for breeding in the following year? 3. 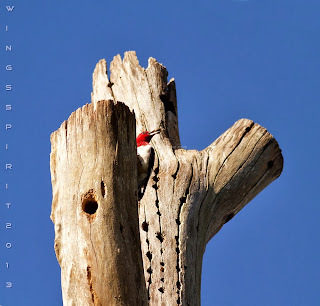 Is there any research done for woodpeckers nesting in man-made nesting box/hole and if the answer is yes, what is the successful rate of fledgling? I know some smaller woodpeckers use power poles, but unfortunately with unknown reasons, not much successful rate of survival with young fledgling. Wow Stunning work! This what i called Animal Planet. BRAVO!